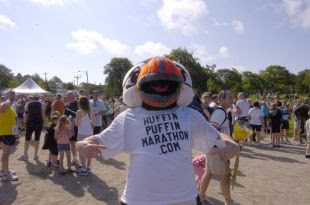 Among the 2700 or so runners completing yesterday's Tely 10 was the character pictured above, running to let people know about the September 26 Huffin' Puffin Marathon. This event is the traditional Provincial Marathon and Nautilus Half Marathon, with the newly added Marathon Team Relay for teams of 4 runners with each completing about 10k of the marathon course. All participants get a commemorative finishers medal and long sleeve shirt, and entry to the post-race BBQ buffet reception at the Bowring Park Bungalow. More information and registration available at huffinpuffinmarathon.com.